One of the things I enjoy most is watching my cats outside. I love to see them running like the wind, climbing a tree or just lounging in the sun watching the world go by. Inside, they’re part of my world. Outside, they invite me into their world of fiercely independent, resourceful free spirits. Although I know there are dangers outdoors, the benefits of getting cats outside far outweigh the risks for me. And there are dangers indoors, too. Despite what you may read online, the vast majority of indoor/outdoor and outdoor cats live as long as “strictly indoor” cats do and die of the same diseases of old age… kidney failure and cancer. In the meantime, they’ve enjoyed full, interesting lives. And they’ve had the opportunity to be cats, free of the human rules and roller coaster emotions that become as much a part of their lives as they are of ours when they’re inside. Since you can read about the hazards of letting cats go out just about anywhere online, we’re going to focus on the reasons why we should be getting cats outside. If you live on a busy street, or in an otherwise dangerous neighborhood or in a high-rise apartment building, your cats can’t safely be free-roaming indoor/outdoor cats. But there are still ways of getting cats outside so they can enjoy the benefits of some fresh air and sunshine unfiltered by screens and windows. Please… Get your cats neutered/spayed and microchipped before you let them go outside. So here are the six reasons why we should be getting cats outside. But first a clarification: There are many ways of getting cats outside. Think about taking your cat out on a harness and leash, providing supervised outdoor time or building an outdoor enclosure or catio. An apartment balcony (put wire mesh in front of the railings if you’re afraid the cat will fall or jump) or an elevated deck will also work. 1. Cats who go out are healthier. Despite what you may have read, this is true! Numerous studies show that cats who live strictly indoors are more likely than indoor/outdoor cats to suffer from such stress-related illnesses as bladder stones and crystals, allergies and irritable bowel disease. 2. Cats who go out shed less. Cats with exposure to outdoor shed in the spring and fall to prepare for the coming season. But strictly indoor cats shed year round because of the more constant temperatures and indoor lighting. 3. Getting outside prevents boredom, depression and obesity. 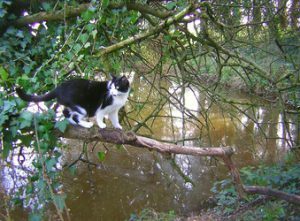 Providing a truly stimulating and interesting environment that encourages activity for indoor cats can be difficult. That’s one of the reasons why so many strictly indoor cats sleep and eat too much. Instinct tells cats to run, hunt and explore. “Without these psychological needs being met, they ultimately become clinically depressed,” cat behaviorist Pam Johnson-Bennet said at a 2001 Western Veterinary conference. In the ever-changing world outdoors, there’s always something new and interesting to explore. 4. Some outdoor time relieves stress and increases stress tolerance. Cats who stay indoors live in an environment that is static and always the same. So even the tiniest change can be stressful and can cause behavior problems. Cats who go out tend to be more flexible and better able to cope with change. They also tend to be more tolerant of humans they don’t know well, like repair people and pet sitters. 5. Safety: Cats who are used to being outside know what to do and were to go if they get out by accident. And they can make the transition to living completely outside if a family member becomes allergic or other circumstances change. Two of the main reasons why cats die in shelters are allergic humans, usually a young child or new baby, and litter box issues. Indoor cats who constantly bolt for the door will get out eventually. Then they could be gone for days or even weeks, if they come home at all. It’s happier and less stressful to train your cats to go out on your terms, instead of theirs. 6. Getting cats outside indulges their free spirits: Many behaviorists believe cats are closer to their wild ancestors than any of our other domesticated animals. Some believe they’re not domesticated at all. 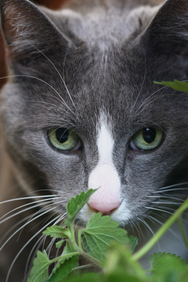 Getting cats outside allows them to breathe fresh air and run and hunt and do all the things instinct tells them to do. And they’re able to get away from our rules and human moods and emotions, if only for a couple of hours.